Do you normally harvest them this early?. Our pomegranate crop will not be as good as the last couple of years, but the pomegranates look very healthy. We probably had a lot more rain than you did. Not normally this early, Jorun, but with the 2 year drought we've been suffering the overall food supply for our feathered friends has been severely reduced, so they are taking more than their normal share. We had to get in while there were still a few left for us. The rats have eaten ALL of my pomegranates this year. We planted 3 pomegranate trees, of the new variety, a few years ago. ( the trees came free) The middle tree produced one fruit. Luckily the birds have not eaten it. Does anyone know about how long before a Pomegranate usually starts to flower/fruit? I have a very healthy little tree on the back lawn which I am scanning for the first sign of a flower (remembering that we are now late spring here). I was given it about five years ago and it is now about 80cm tall. I planted it to remind me of one in my mother's old garden, which was probably 90-odd years old, and which every spring would be covered with those waxy scarlet flowers, and glowing red fruit in autumn. 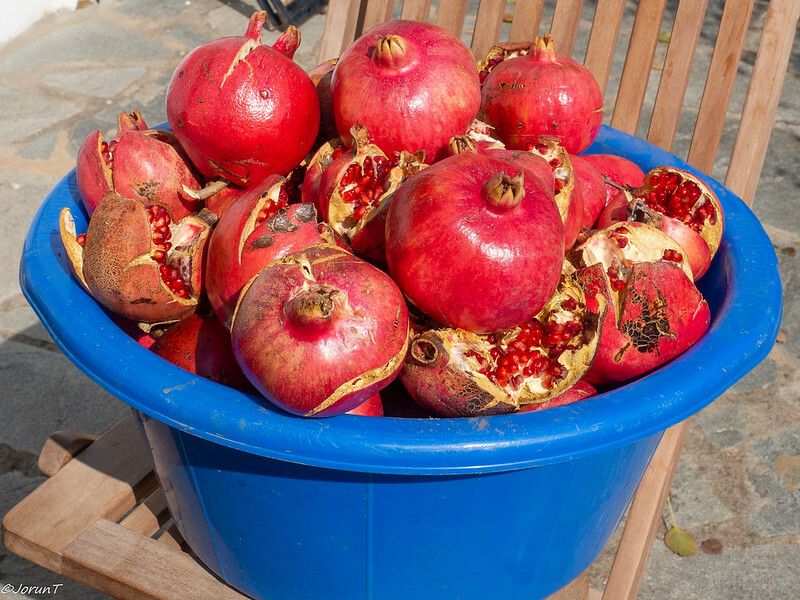 I read that it usually takes 4-6 years before they start bearing fruit, but that they can get 200 years old, see some more info here: https://homeguides.sfgate.com/long-pomegranate-tree-grow-61116.html . My two pomegranates took longer, though, our soil is not very good, but they now give us plenty of fruit now, although not every year. This year was not a bad one. I got 6 kg pure pomegranate juice out of these, and my fingers and nails were dark brown for weeks afterwards. Jorun, what are you going to do with all this jelly? Our neighbor has started farming pomegranates a few years ago and he sells to the market. 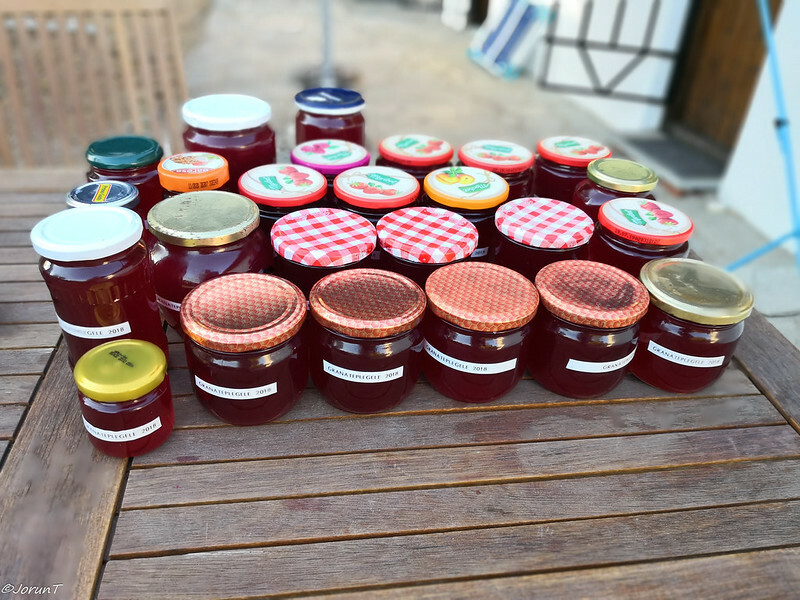 I bought some to make jelly but we have been eating them instead. I will ask him the name of the variety and how long it took for them to fruit. My Pomegranate tree, planted four years ago when probably about three/four years old, produces many flowers but sadly, so far, the most fruit it has set is three. That was this year when one matured into a large fruit whilst the other two remained very small. Fortunately the birds do not seem interested in them, either don't notice them or are too content gorging themselves on the abundant Kaki fruit nearby. Here I am again with the information promised regarding names and time needed to produce fruit. I asked our neighbour and one of the variety is called Wonderful. It took only two years to produce. The fruit is juicy but has big pips. He gave me a pomegranate to try this morning. Variety name unknown for now but it took 3 years to produce fruit. It is his favourite pomegranate and I think he is correct in his choice. The fruit is very juicy and has tiny pips. They planted the cuttings in the ground in the winter because it is cooler and in the hope of rainy days. I also like to say that our pomegranates seeds do not pop out when you hit the fruit with the back of the spoon. They are embedded in so well they have to be cut open with a knife. We get very badly stained fingers. No rubber gloves .